InDesign, how do I make chapters vary in colour scheme? I'm new to InDesign and am working on a catalogue for my company. I'd like each catalogue chapter to have a different colour scheme - e.g. chapter 1 uses blues, chapter 2 uses reds, etc. I've designed master pages, so is there a way to use those masters for my pages while changing the colour swatches used? That is to say, I'd like to be able to change a page's colour scheme while having it still use the masters. The best approach I've found so far is to override the master elements whose colour I want to change and then change it manually. This works, but it is tedious. Also, when I change text in my masters, it does not change on pages where that text frame was overridden. Is there a better way to do this? Thanks! You can simply change the color on your associated master pages. Remember you can apply master pages to other master pages. So you can set up a master page for common, non color-altered elements and apply that to all the other master pages. In the image above Master page A contains common elements, then is applied to all other (chapter) master page sets. To answer your specific question about swatches... no, you can't have "swatch sets" or any other "theme-like" settings which can be applied to pages as a whole. Create a Master Folder for your project. Create a Master Template file containing your master pages and your first 3 pages, one front page and a spread. Inside this file you want to set up the colors that will change in your color pallet. or how many colors you have in each color scheme. This will allow you to swap out colors later on in the process. Save this file in your Master Folder as tmeplate-master.indd, as shown below. A note from experience: It is helpful if this file is well thought out before it is built to save work updating the chapter masters after you have created them and added them to the book file. Inside Master Folder create a book file, shown as book-file.indb below. Create your first chapter folder, shown as 01-'Chapter 1 Title' below. 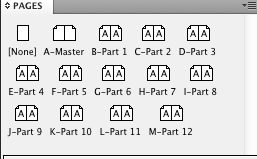 Copy the file template-master.indd into your first chapter folder and rename it to the same name as your first chapter folder, shown as 01-Chapter 1 Title.indd below. Repeat Steps 4 & 5 for the total amount of chapters you have in your book. Once you have all of your chapters created open book-file.indb in InDesign. Add each chapter file using the + button in the Book Dialog Box. The Book Dialog Box will automatically pop up when you open the book file. Open your first chapter 01-Chapter 1 Title.indd in InDesign and open the color pallet. When in the color pallet open up the template colors you set up way back in Step 2 and change the colors, save, and close them. This will change the color for every object that the color is attached to in your file. Now you can do this for each file you created in Steps 4 & 5 and added to your book file in Step 6. This process will give you consistent masters across all chapters while not having to override anything. Also if you need to make changes to your master page you can make you updates inside your tmeplate-master.indd file and then open each chapter and just paste your changes in and you will be all set. Example: I just finished a 200 pg. catalog in english, now I am re-creating it in french, so it was easy to change every footer by making the change in tmeplate-master.indd and copy/pasting that change into each Chapters Master Pages. Objects I would have otherwise overridden. This does take some time and patients to set up but I can tell you that it is well worth it in the time you will save in the end, especially when you would have had to change all of those files that you had to override in your current process. The way Scott said to do it is ok if your working in a small file, but I assume because your using the 'chapter' terminology that your making a larger file. I would split any file up into separate indd files that are considered different chapters for practical reasons such as finding issues easier and keeping track of changes, and E/Os. Below is the file structure I typically use when building book files as referred to several times in the list above. Not the answer you're looking for? Browse other questions tagged color adobe-indesign master-page or ask your own question. InDesign: How to restore group element to master? How to ensure a photo changed on an Indesign master page carries to all child pages?